The world economy may be on the slide and Britain already experiencing the cruel effects of the Great Slump but few of the 30,000 plus crowd who thronged to Lord’s today, Saturday, the second day of the 1930 Test against the Australians will have given their fears much thought. Instead they have been treated to a remarkable day’s cricket and witnessed the arrival on the cricketing stage of no less than a phenomenon. The 21 year old, Donald Bradman, was playing ‘up country’ for Bowry only four seasons ago. A year later he was beginning to make an impact in Sydney grade cricket scoring 110 in his first innings performing at that level. Two seasons ago he was forced himself into the New South Wales side where he again scored a century of debut. And just over a year ago, as a twenty year old, he was appearing in four of the five Tests against Chapman’s England tourists, making a couple of centuries at an average of 66 for the series. A fortnight ago, at Trent Bridge, he defied those who thought he might be too inexperienced to succeed in English conditions by scoring 131 in the fourth innings and giving England the fright and the fight of their lives. Today, Third Man again used his trusty steps to hurdle the wall behind the famous clock tower and joined the expectant crowd, this time choosing to sit in the new Grandstand. This stand which truly embraces modernity affords a view so close to the action that one feels as if one is actually on the field of play. We had to wait until 3.30pm before the young man made his entry. This morning the England last wicket pair added a useful 38 to bring the score to 425. 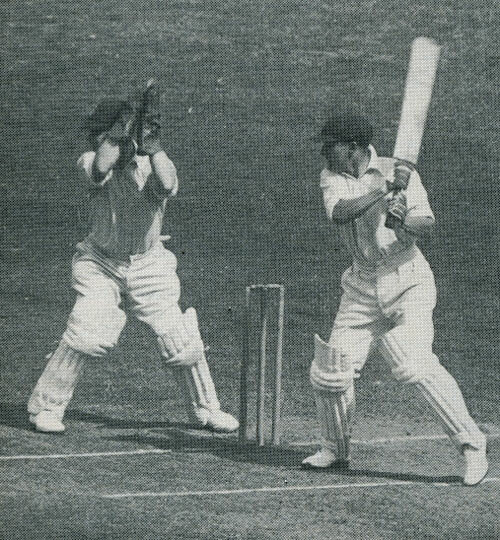 But by mid-afternoon with the Australian openers, Woodfull and Ponsford, undefeated on 150, and barely a third of the match completed, that England score already looked inadequate. 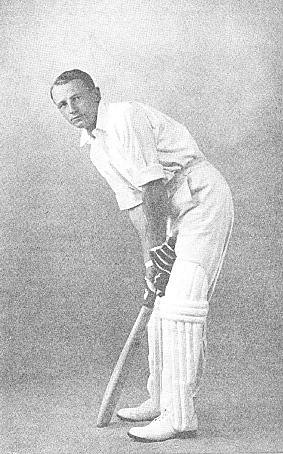 Bradman, batting No 3 as he had in the second innings at Trent Bridge, joined Woodfull at 162 – 1 and immediately the run rate accelerated. 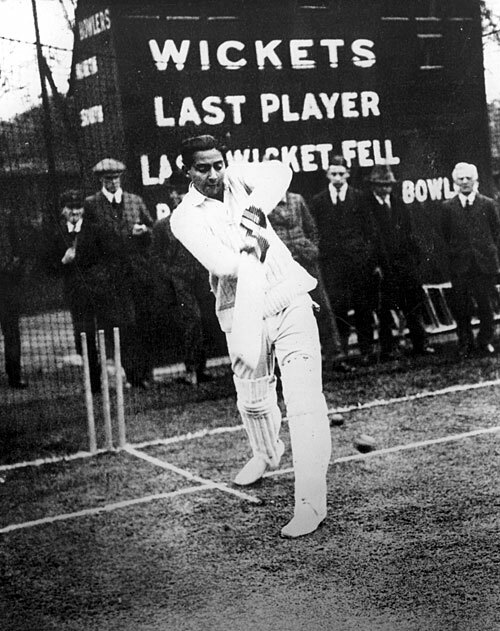 Finding the right length to bowl at Bradman must be a fruitless search for any bowler. 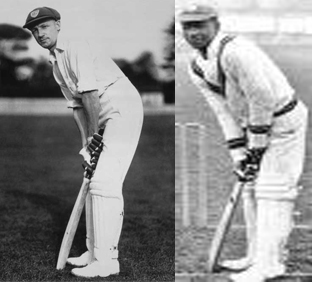 The slightest shortness of length and he is quickly back on his stumps to cut or pull, as this photograph illustrates well. Every ball played square of the wicket is hit downwards and accurately to the boundary with surprising force for so slight a young man. 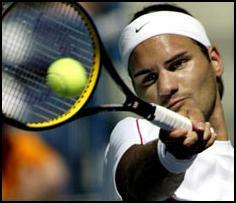 Fuller length balls are driven with ease from a high back lift that may start at gully but whips down straight and with great speed. 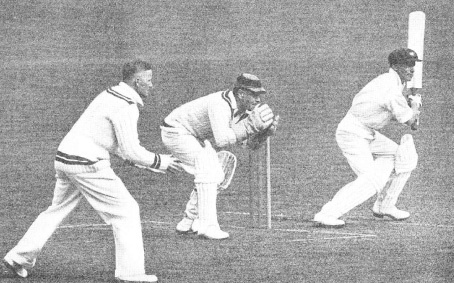 The plucky Robins bowled well and should have had Woodfull stumped when he was 52 but to Bradman, so quick on his feet, this crafty bowler found himself under huge pressure as the batsman advanced down the wicket to destroy his accuracy under a hail of shots. Only the valiant and frugal Tate seemed able to stem the flow of runs. Limited to no more than two runs an over at Tate’s end, the pair made hay at the other, adding 231 in 154 minutes. Finally, at 393 – 1 and after five and a half hours at the crease, the Australian opener Woodfall was stumped off the bowling of Robins for 155. 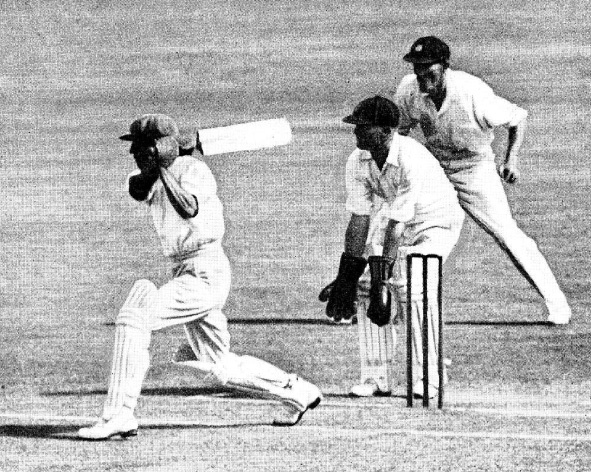 In the last moments of play Australia took their score to 404 with Bradman 155 not out in a chanceless innings of two hours forty minutes during which every shot he played dissected the field exactly where he had aimed. 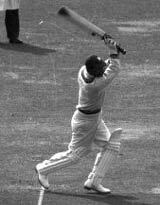 It was batting of the highest technical brilliance. Great cricketers are inspired by the performance of other great cricketers and shots of the class we have witnessed in the last two days contained elements of competitive flair. Bradman must have known that he had witnessed something special from ‘Mr Smith’* yesterday and today he attempted to emulate that mastery and succeeded. Those of us who were lucky enough to be here on both days have enjoyed two of the finest innings ever played on this special ground. We are still only half way through this Test. With a rest day tomorrow, Australia will no doubt drink the night away at the Wardorf, dancing with the debutantes who after a few days at Ascot had ended this week of their Season in fine tradition by gracing the new ‘boxes’ in the Grandstand immediately below where Third Man was sitting. We hear that Government revenues are vanishing, that the new Coalition Government of Labour’s Mr Ramsey and his Liberal friends are intent on restoring Victorian values with a classically balanced budget. Cuts may therefore be on the way, unemployment may be rising towards 2 million, exports may be plunging, stock market values may be on the floor, but at Lord’s today there was no sign of the Slump. The finest cricket ever played on this famous ground has dispelled the gloom. One and all left Lord’s with a spring in their step and an image of this young man Bradmen etched in their memories forever.